Let’s face it folks, there is an ever-increasing demand for truly functional green gear for today’s busy families on the go. Couple that with deep concern over the planet that we are passing on to the next generation, and it’s enough to really keep you awake at night – besides the obvious parenting demands! Enter Fleurville’s eco-fabulous line of recycled plastic bottle fabric totes and packs that keep (on average) ten 600ml plastic water bottles out of the landfill! We love their Spring 2008 floral prints and clean graphic contours. These spacious and lightweight totes and shoulder bags function equally well as diaper bags or simple on-the-go carryalls. Fleurville makes parenting a breeze by sending the right message to little ones looking on from their strollers as inheritors of the planet. 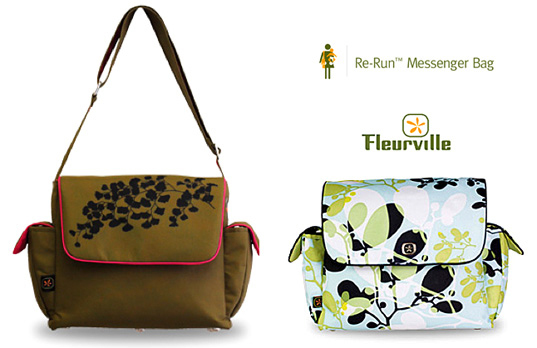 The Re-Run Messenger Bag is slated as a new and improved version of Fleurville’s “already perfect” MotherShip Bag. Smaller in scale, spacious, more lightweight and still made out of Re-Run recycled materials, this stylish piece of mommy/daddy gear is totally green glam. The adjustable shoulder strap has a wide range of fit enabling you to wear it as a shoulder bag, messenger bag, or over the stroller tote. Fleurville products are also PVC-free, a great benefit as lead is usually used to stabilize PVC. Even better, the Messenger comes with a changing pad, see-thru Fleurville-branded wipe case, carabineer and multiple, elastic topped pockets, as well as a fleece-lined pocket to protect your iPod/sunglasses/cell phone from being scratched. 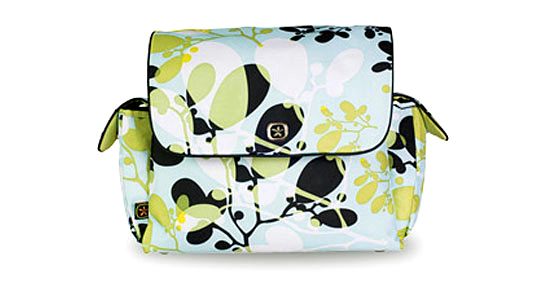 The Messenger’s main flap is also silk-screened with a floral botanical print. The Re-Run Messenger Bag by Fleurville is yet another inspiring example of how green design and sustainable style seem to just get better with the passage of time.